Sion View Bromo Hotel becomes the Indonesian tourists’ destination when they are going to travel in Bromo. So, for those who want to travel to Mount Bromo East Java, do not worry in choosing a place to stay. This hotel is one of the hotels in the tourist area of Bromo. The hotel has many features and facilities that you can enjoy either alone, with family, friends or business clients without disappointment. The beauty of Bromo Mountain is undoubtedly. The natural beauty and stunning natural sites are served. 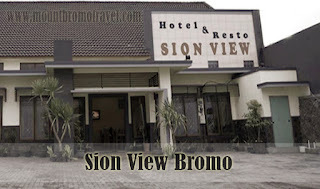 Location of hotel Sion View Bromo. Sion View Bromo Hotel has a strategic location. This is because the hotel is located just 2 kilometers from the tourist area of Mount Bromo and 100 meters from SM Bromo Hotel. This hotel is located in Jalan Raya Bromo, Wonokerto village, Ngadisari, District Sukapura, Probolinggo. By staying in this hotel, the tourist will be treated with the best views of nature Mount Bromo that unhindered. In addition, the hotel is intentionally designed with the minimalist and traditional ethnic that are very pronounced. So, it fits better with the beautiful atmosphere of Mount Bromo nature. Facilities of Hotel Sion View Bromo. Facilities that are provided in this hotel are extremely diverse and special. The hotel offers a wide range of hotel room options include standard room, family room, superior king room, suite room, superior triple room and deluxe room. Some of the hotel rooms have been available with hot water to pamper the customer in the bathroom. Each room in the hotel is also completed with mineral water, television, fridge, and a private bathroom. In addition, the hotel also has a restaurant that serves a variety of menus with great taste that can be enjoyed every day. The parking area in the hotel is safe and convenient to use by the visitors. And for more special feature, this hotel is serving the customer with the excellent service for 24 hours with such facilities that can’t be obtained in the other place. Besides the location that is strategic to Mount Bromo and the complete facilities, this hotel is a high recommended to the tourists because this hotel is also close to the other destinations. The other tourist natural destination is Bentar beach. This beautiful beach is only located about 12 kilometers from this hotel. More than that, Lake Ronggojalu is also near. It is approximately 15.6 kilometers. Besides, Gili Ketapang is also in short distance. It is only about 16.4 kilometers. And the tourist just needs to travel by car from Sion View Bromo Hotel about 19 kilometers to Pekalen River with the best great scenery.